Beveley Weston (Sam Shepard) an alcoholic academic goes missing, and the three daughters he had with pill-popping wife Violet (Meryl Streep) return to support her. But each have their secrets and problems leading to a massively volatile time. I think it held up extremely well. It’s certainly not a happy film; if you are ever feeling that you are taking your family for granted, watch this. You will love them so much more. So many horrible people in one place. It is surprising that the film has only been nominated for awards for acting in the Oscars and Golden Globes. With such a strong story and excellent performances, I would have expected it would at least be nominated for Best Film. It’s a far better film that The Wolf of Wall Street. But then, it wasn’t directed by Martin Scorsese, and the main performances are by women. It seems to be a bit of a pattern for the awards I’ve noticed; the films that have been nominated for best performances by actresses are less likely to appear in the best film category than the films nominated for best performance by actor. Sexist? Or are women just not getting leads in good films? Are male stories better? Am I making a mountain out of a molehill? 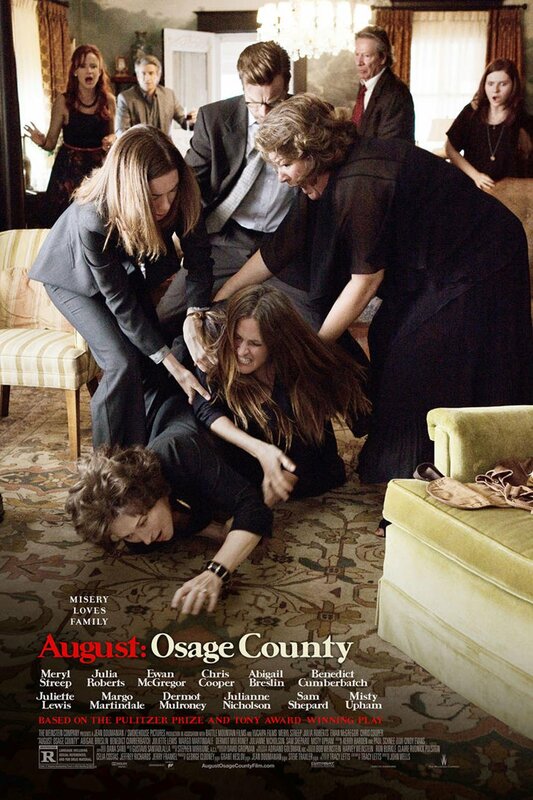 August: Osage County was nominated for Oscars for Best Actress in a Leading Role (Meryl Streep), Best Actress in a Supporting Role (Julia Roberts), for Golden Globes for Best Actress in A Motion Picture, Musical or Comedy (Meryl Streep), Best Supporting Actress in a Motion Picture (Julia Roberts) and for a BAFTA Supporting Actress (Julia Roberts).